I read this book a couple of years ago and I would've sworn that I had reviewed it here, but looking back through the archives I find that I am mistaken. The book was turned into an award winning Broadway show, which I have not seen. But the book was superb. Mr. 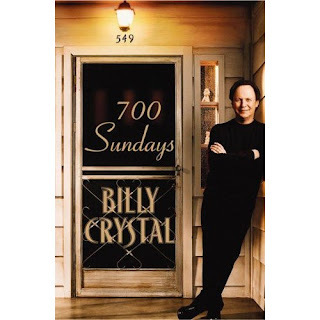 Crystal's father died when Billy was about 14 years old. This amounts to about 700 Sundays, which he recalls spending with his Dad, Jack, who owned Commodore Records in Times Square along with his brother, Milt. They specialized in jazz records that were hard to find. His Unle is credited with the jazz revival that swept Manhattan in the late 1940's. Raised in a household of laughter and music, the book gives us a clear view of just where Mr. Crystal's talent and wit come from. Guests in his parents home often included Billie Holiday and Louis Armstrong. It was Mr. Crystal's Uncle who convinced Ms. Holiday to record "Bitter Fruit" which was written by a white, Jewish schoolteacher named Abel Meeropol, who lived in the Bronx. 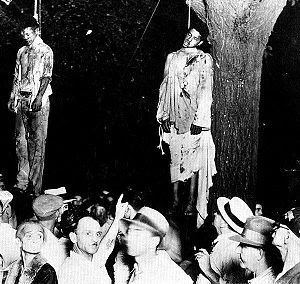 He wrote the song after seeing this photograph of a lynching. At the time she was under contract to the Columbia label, which refused to release the song. They did grant her a one recording leave of absence in order to record it. There are actually two recorded versions of the record, which eventually became, after her death, one of her most popular numbers. If you have never heard the record you have missed one of the most haunting and poignant songs ever written or recorded. The book is, however, not all doom and gloom. The Sunday outings to Yankee Stadium with his father, which made Mr. 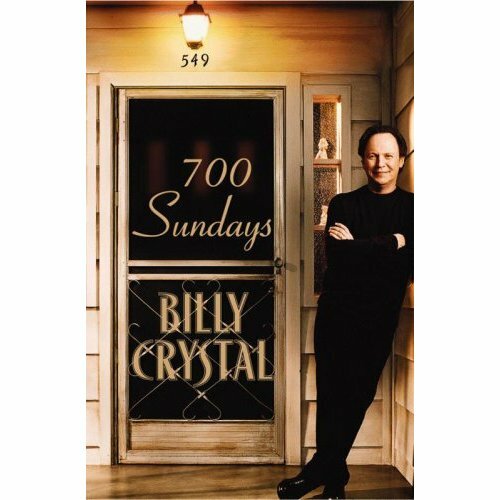 Crystal a life long fan of the New York Yankees, is but one aspect of the book, which is filled with hysterical family stories and the observations of a sharp and talented young man. The book is a wonderful snapshot into the daily life of New York in the 1950's as well as a wonderful portrait of the special bond which existed between Mr. Crystal and his father. I have read reviews of the show which state "The eponymous play met with considerable success on Broadway. The book is an adequate substitute for it." I suppose it all depends upon which you experience first, but since I have not seen the play I can only judge it as a book. And that judgement is a very high one. This is one of the best books I have ever read concerning a young man's love for his father. With Fathers Day fast approaching, this just may be the gift you are looking for to give to that special Dad in your life.